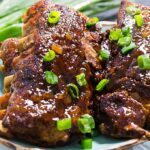 Crock Pot Hawaiian Ribs are fall off the bone tender and covered in a pienapple-teriyaki based sauce. These ribs cook on LOW for 8 hours so this is a recipe you can leave in the crock pot all day. Then it just takes a few minutes to finish off. You’ll make a quick, pineapple-flavored BBQ sauce, brush the ribs with it and broil them to get them a little charred. Just like they came right off the grill! 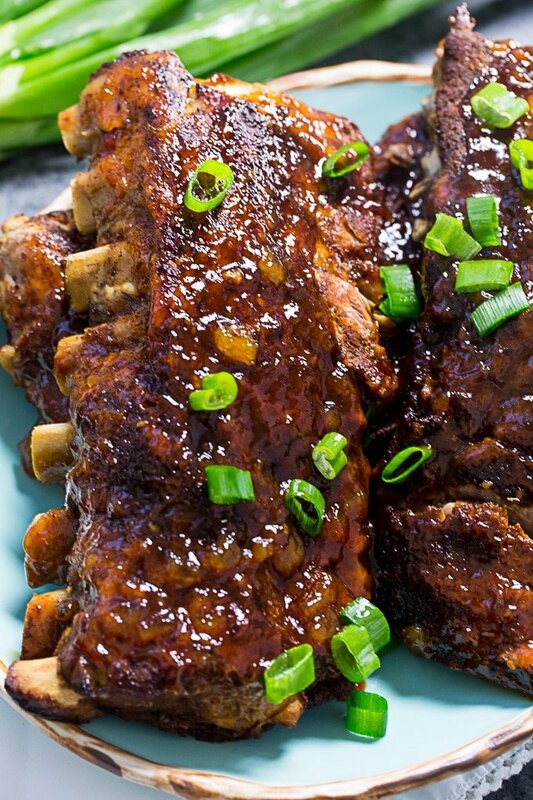 You can serve delicious ribs for dinner and its so easy thanks to the slow cooker. 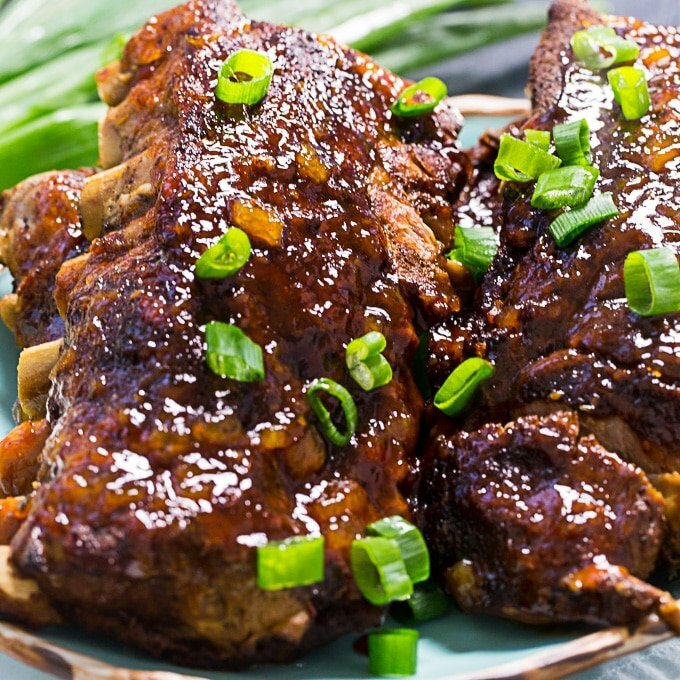 What’s to love about these Crock Pot Hawaiian Ribs? It only takes a few minutes to prep this recipe. The ribs get seasoned with salt, pepper, and ancho chili powder. The ancho chili powder adds lots of smoky flavor. These ribs have so much flavor! Remove the silver skin from the back of the ribs before cooking them. Lift it up with a sharp knife and then you should be able to pull it off in one piece. It’s not absolutely necessary to remove it, but the ribs will separate more easily if you do. Season ribs with salt and pepper. Rub ribs with vegetable oil and sprinkle with ancho chili powder. Add 1/3 cup bbq sauce, apple cider vinegar, ginger, and garlic to a 6-quart or larger slow cooker. Stir to mix. Add the ribs and turn to coat in the sauce. Preheat the broiler. In a small bowl, whisk together 1/3 cup bbq sauce, pineapple preserves, and ketchup. Whisk in 1/4 cup of cooking liquid from the crock pot. Arrange ribs bone side down on a baking sheet lined with aluminum foil. 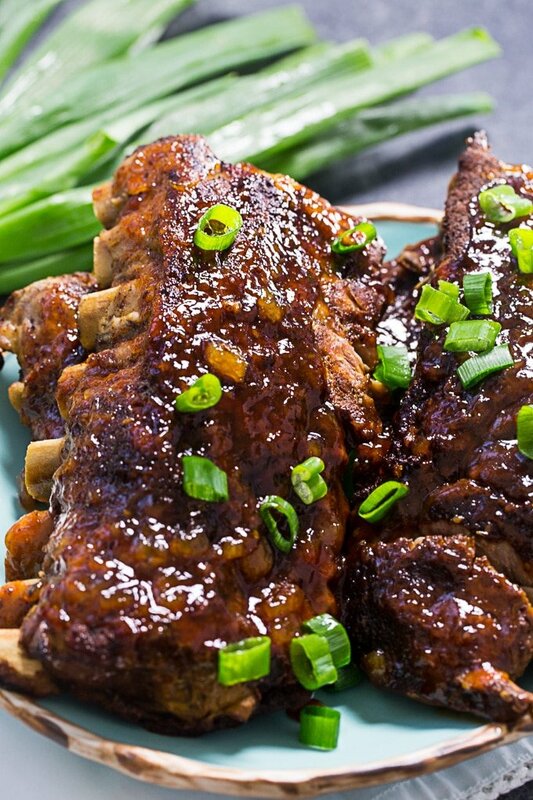 Brush tops of ribs with pineapple preserves mixture. Broil for 3 to 5 minutes. Sprinkle with green onions. This entry was posted in Slow Cooker and tagged Pork, ribs. Bookmark the permalink.